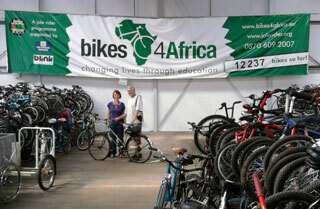 If you’ve got an unwanted bike, there’s a great Gloucestershire charity that recycles bikes for Africa to help students in Gambia get to school or college. I recently combined a meeting with one of my copywriting clients with a visit to Jole Rider in Tetbury. While there, I dropped off an old touring bike that had belonged to my late mother-in-law. Mary would have been thrilled that her trusty Raleigh Trent (complete with original Brooks sprung saddle) was going to help the kids rather than gathering dust in a garage or going for scrap. Whether the old Trent will actually go to Gambia or go into Jole Rider’s Heritage Collection remains to be seen – either way it will be helping the Jole Rider cause which is good. My visit was a good opportunity to catch up with David Swettenham and his partner Helen King (like me, a copywriter and novelist until Jole Rider took over her world) who started Jole Rider. They founded the charity a few years before I became a freelance Gloucestershire copywriter in 2006. Now, having recently moved from an old hangar at Hullavington, their modern, spacious Tetbury unit is a great location for developing their work. In fact, as I arrived, the latest 423 of more than 12000 bikes were heading off in a container. With your help, the magic 20,000 bikes milestone can’t be too far away. 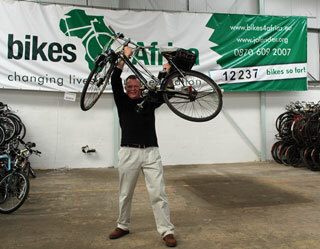 So, have you got an old bike that can be done up by the Jole Riders team and sent to Africa or sold to raise funds at their associated Bike Shed retail outlet? If so, please contact Jole Rider through their website. It’s a wonderful cause and they’ve already done brilliantly. They’ll appreciate any more support, no matter how small, as they continue their work. This entry was posted in Uncategorized and tagged cheltenham copywriter, copywriters gloucestershire, freelance copywriter in gloucestershire, recycling bikes for africa, recycling bikes in gloucestershire on September 7, 2013 by alwrites. I’ve been a bit quiet on the blog posting front over the last few weeks. Put it down to a combination of loads of work (mainly website and client case study writing – love it!) and a bit of travel. I was back up in Shetland a couple of weeks ago. It was our third trip and the place just grows and grows on me – especially when the weather is as good as it was for our week there. While I was up north, I was invited to pen another guest post for Uradale Organics – and be able to legitimately call myself a Shetland copywriter, or at least a copywriter in Shetland. It’s always a pleasure to help promote Ronnie and Sue on the croft above Scalloway – particularly so this time as they have spent the best part of the last year sorting out the mess from the massive peat slide that nearly swept the croft away just after our visit last August. If you are interested in organic beef, lamb or wool – or any aspect of the modern face of Shetland crofting – this is a fascinating blog to follow. As you will see from the post and the rest of their blog, success (and a wee bit of fame) has come out of the post-cataclysm events. 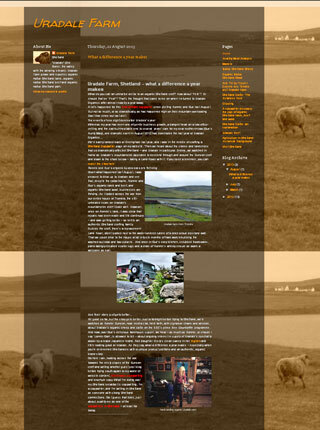 Not least because the croft was featured on BBC Countryfile when they did a Shetland special a couple of months ago. Keep up the good work at Uradale. This entry was posted in Thank you blogs and tagged BBC, cheltenham copywriter, copywriters gloucestershire, Copywriters in Shetland, countryfile, crofting, marketing copywriting, shetland copywriters, uradale on September 2, 2013 by alwrites.